Joan Crawford put us in a Hollywood mood, the Oscars® are just around the corner, so what better than an awards ceremony? Charlino from the Vikisfinds Yahoo forum, which is about artistic dolls and OOAK dolls, gives us the equivalent of Oscars for the dolls that are made to resemble Hollywood stars. There are many artists out there that painstakingly recreate the likenesses of film stars on their favourite dolls, some with amazing success.And although doll companies do produce dolls authorized to look like actors from certain films or series, there is no comparison with a well painted OOAK doll. So go vote at the website created just for this - no registration needed. Just look at the many dolls nominated (the list is longer than the Oscars!) and cast your ballot! Below you can see a selection of the nominees - there are many more equally beautiful on the website, so go go go!!! 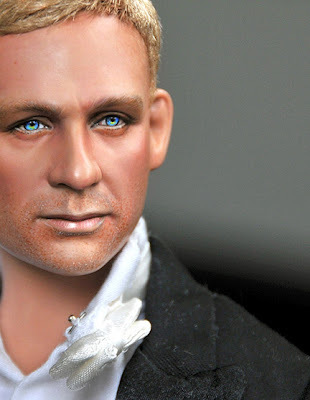 Daniel Craig by Noel Cruz, whose doll, Deborah Kerr won last year. Angelina Jolie must be the most popular star to make - here is another one by Noel Cruz. All photos courtesy of the respective artists and/or their owners. Oh bummer -- to vote you seem to have to register. I'm leary of doing that. To NOMINATE a doll you have to join Squidoo. To VOTE one of the nominated is without any registration. Thank you for your beautiful display of some of this year's Hollywood Doll nominees for Best In Show. To the best of my knowledge, no one has to register with Squidoo or anyone else to nominate or vote for their favorite Hollywood Doll. If anyone has trouble with nominating or voting for their favorite Hollywood Doll, please do not hesitate to contact me. May the best doll win, and may all who visit enjoy the art of the doll. They're all gorgeous dolls. 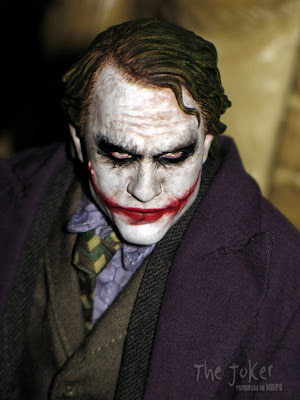 The Heath Ledger doll is beyond belief as it is so real looking and a perfect representation of the character in the movie. Has this contest ended and if so, where would I find the results? Dear Terri - yes they are indeed amazing. The links are both in the text of the first paragraph as well as in Charlino's comment above. Enjoy!